The rose star has 8-16 rays (usually 11) and a wide central disc. Its aboral surface is covered in many spines. It tends to be pinkish-red, though its colour may be more orange or purplish; there is usually a variable pattern of white, pink, orange, or yellow concentric rings (see photos on iNaturalist for the range of colours and patterns). This distinctive sea star gets to 34 cm in diameter including arms. 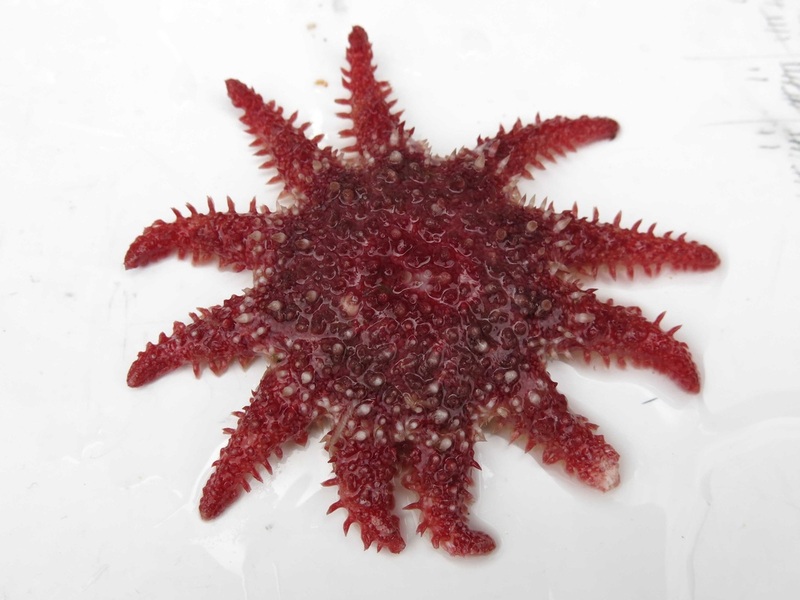 The rose star can be found in a variety of low-current habitats. It is often found in rocky areas, and inhabits the low intertidal and subtidal to 1200 m. This circumpolar species is found from the Arctic south to northern Washington, as well as south to Japan and China, New Jersey, and Britain. This species preys on anemones, sea pens, nudibranchs, small sea stars, and other invertebrates. It can move at speeds of up to 70 cm per minute, a relatively fast speed for a sea star. Cowles, D. (2005). Crossaster papposus (Linnaeus, 1767). Invertebrates of the Salish Sea. Rosario Beach Marine Laboratory. Accessed 04/02/2015. Harbo, R. M. (2011). Whelks to whales: Coastal marine life of the Pacific Northwest [revised]. Madeira Park, BC: Harbour Publishing. P. 175. Lambert, P. Crossaster papposus (Linnaeus, 1767). In Klinkenberg, Brian. (Ed.) E-Fauna BC: Electronic Atlas of the Fauna of British Columbia. Lab for Advanced Spatial Analysis, Department of Geography, University of British Columbia, Vancouver. Accessed 04/02/2015.